PARiM mobile app helps you to manage your shifts and allows you to choose how often and when you want to receive reminders or information via push notifications. There are two different types of notifications - personal shift reminders and push notifications for real-time system updates. 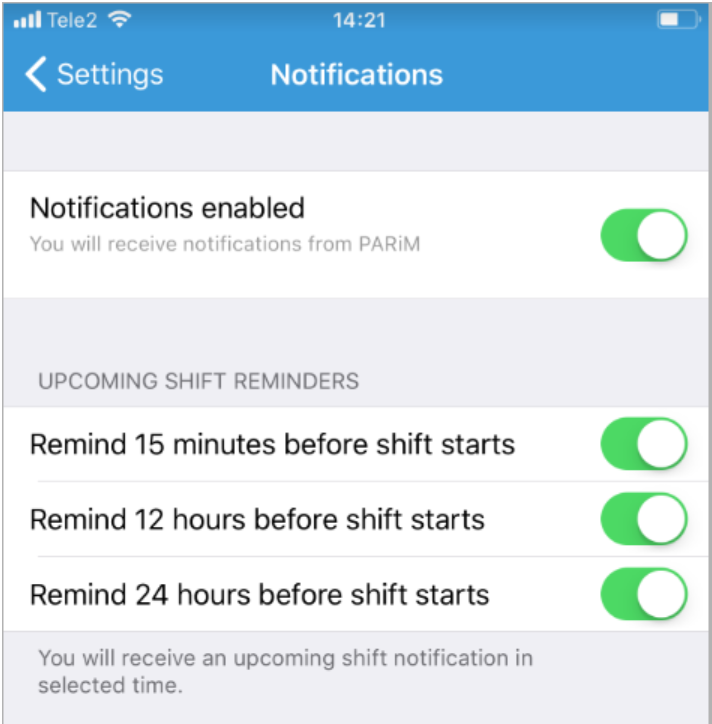 PARiM´s mobile app can also notify you about shift changes, new shift assignments, shift cancellations and other real-time information via push notifications. These will be displayed only if you have chosen under phones settings that you want to receive notifications for PARiM's mobile app. You are able to turn on the notifications on when you log in the to the app for the first time as then the app asks you if you want to receive the notifications or you can turn the notifications on later under phone settings for apps. Push notifications will help Managers and Supervisors to have real-time information about people’s time and attendance as the notifications will let them also know if an employee is late, doing overtime or has finished the shift early.